Expertly trained employees, whose level of knowledge is always kept up-to-date are generally more motivated, creative, and very often contribute fresh ideas and problem-solving techniques. The consistent planning, administration, documentation, and evaluation of all training and qualification matters is also an important safety matter and an integral aspect that needs to be considered when complying with official life science guidelines and standards such as the ISO 13485 or the FDA’s 21 CFR 820.25. 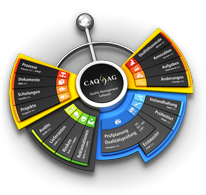 We will be presenting our Qualify.Net training management software within the framework of a Health Capital Berlin Brandenburg training management focus event on the 9th of September in Berlin. This event is hosted by Berlin Partner für Wirtschaft und Technologie GmbH and will be held in German. For more information, please consult the following web-links.